GREP is a traditional tool from the UNIX world for searching through many files using a regular expression. RegexBuddy has a convenient GREP tool built-in. Use it to search through a large number of files or folders. Combine this with RegexBuddy's wide range of functionality to easily create regular expressions, and you will quickly find the information you are looking for. Or, edit many files at once by searching and replacing with regular expressions. Grepping is also a good way to test your regular expression on large amounts of sample data. RegexBuddy greps in preview mode by default, making your tests completely safe, while still performing the entire grep operation (unlike most other grep tools). RegexBuddy offers all the functionality you'd expect from a basic GREP tool. Built on the same technology as our top-of-the-line Windows GREP tool PowerGREP, RegexBuddy outclasses many stand-alone GREP tools. See detailed results on screen, or automatically save search matches to file. Work safely with a variety of preview, undo and backup options. If you are looking for a simple GREP tool, RegexBuddy is all you need. For maximum power, create regular expressions with RegexBuddy, and use them with PowerGREP's unparalleled searching and text processing functionality. 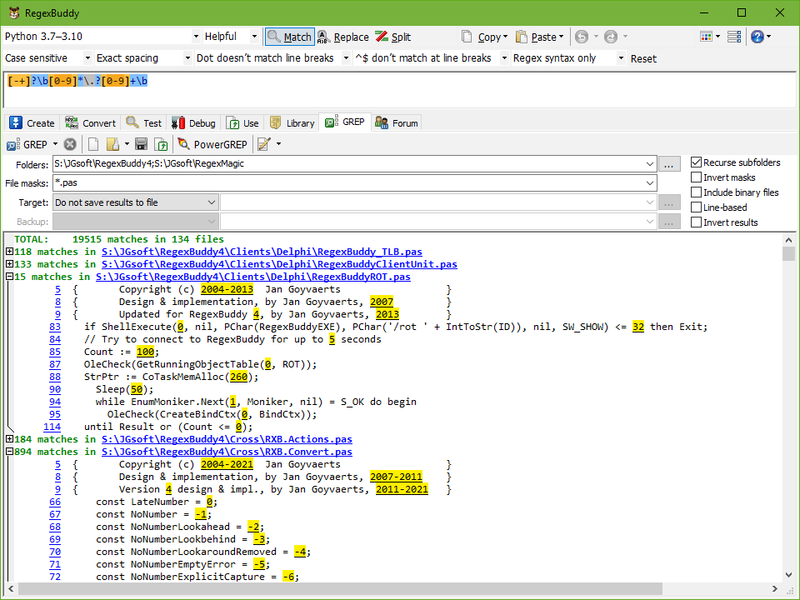 Search (and replace) through files and folders with RegexBuddy’s built-in GREP tool.